Explore YATRA's "Smoke Is Rising" via MXDWN at THIS LOCATION. YATRA's sound is a journey into mountainous sounds, transcending into the deep forests of primeval times. Born from the ashes of Blood Raven, the new three-piece emerged in 2017 as frontman Dana Helmuth's new vehicle to embrace the darkness and doom. Confident in Maria Geisbert and Mike Tull as his new rhythm section, Helmuth's inspiration was fueled exponentially. 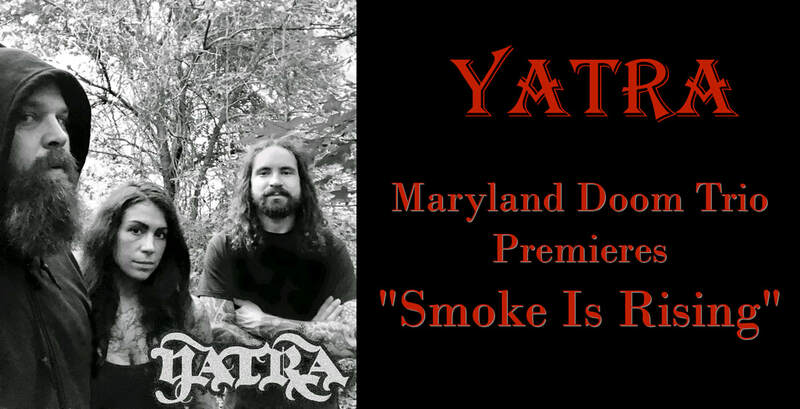 YATRA's full-length debut, Death Ritual was recorded, mixed, and mastered by Grimoire Records' Noel Mueller in August of 2018. The artwork features four mixed-media pieces by Aki Pitkänen, layout by Mueller, and the hand-drawn logotype by Helmuth. With the new song premiere, Helmuth notes, "'Smoke Is Rising'... at the time I wrote this there were a lot of really dark and heavy things going on in my life. I really felt like the lyrics I wrote 'marching dead under crimson skies, rivers they rise up and swallow me' ... so I began to realize that I needed to put everything I had left into this burning sacrifice of YATRA, and I believed smoke would rise from this, and that kingdoms would fall." "We had moved back to the country, into a small cottage in the woods, with no plumbing for the first three months we were there," describes YATRA's founder Dana Helmuth on the writing of Death Ritual. "We had an outhouse and outdoor shower. It was primitive, and it was during that time that I started writing all the material for Death Ritual. The solitude and the darkness of the night put me in a space of prolific writing and I wrote all eight songs in a month. We rehearsed three times a week and immediately started playing live shows regularly in Baltimore and New York City. We were able to channel that same darkness in the writing, also into our live shows, and the positive response was tremendous and really pushed us harder on our journey." In fact, "journey" is exactly what YATRA symbolizes. While traveling through Nepal and the Himalayas by motorcycle in 2013, Helmuth learned the native word "yatra" which means journey or pilgrimage, which he later recalled as the namesake of this new doom trio. The band's eclectic sound combines the harsh, distorted vocal sounds of black metal over slow, heavy doom drones, fuzzed-out sludge riffs, and a tight rhythm section maintained by Maria Geisbert on bass and Mike Tull on drums. YATRA's sound clearly conveys heavy worship and dedication to tone. Helmuth's lyrics draw from fantasy and are influenced by the writings of Howard, Lovecraft, Auel, Tolkien, as well as many references to Norse mythology and Pagan ritual. No love or politics. Fans of Electric Wizard, Cough, and Sleep will find plenty to love in Death Ritual.